I’ve been working on tool rests today. The first job was to make a short tool rest. 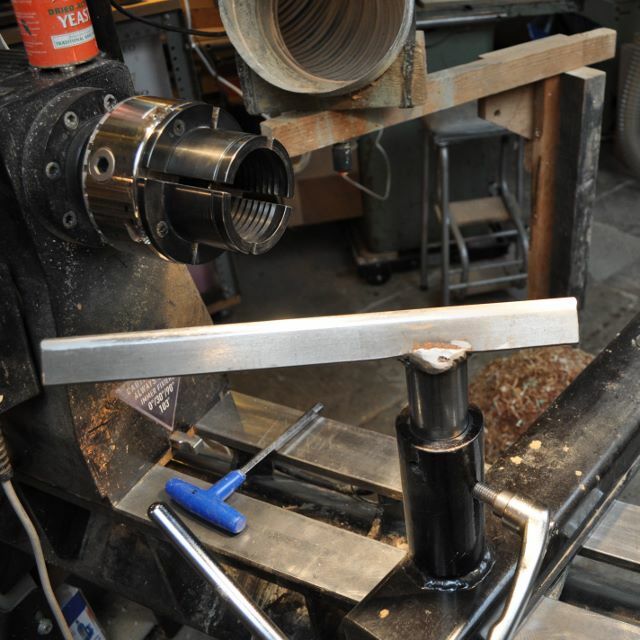 Rests of different lengths are always useful and a short one is handy when you have something held in a chuck with tailstock support and don’t have room for a long one. My lathe takes 40 mm stems but comes with an adaptor sleeve to take 30 mm stems too. I used a reciprocating saw to cut a length of 30 mm mild steel bar for the stem, sawing it at an angle. Then I cut a short bit of thick mild steel strip and arc welded it to the angled end of the stem. I’m a terrible welder and the result isn’t pretty. But I hit the rest with a hammer to test it and it seems solid enough. The photo is of a longer asymmetric rest with a 40 mm stem. Tool rests in past times were often made of wood. Here is one I made. Next was improving the top surface of all the rests. My tool rests are generally in quite good condition, without dents or cuts or rust. I often rub them with a bit of wax to help the tools slide. Today though I spent some time polishing the tool contact line. I started with a fine file, then abrasive paper. Finally I used a buffing wheel with steel-cutting compound, aiming for a mirror finish. I treated the lower surface of some of the tools too. The result was very good. The tools now slide better than they did with wax. It was very noticeable with the spindle roughing gouge – the back of the gouge was already bright metal, but there was a great difference after it had been polished. I strongly recommend paying attention to this. If the tool doesn’t slide freely it makes smooth cutting much harder. A lot of chisels are sold with raw, sharp edges and are almost unusable until they have been fettled, as well as damaging the tool rests.